WASHINGTON -- The U.S. Congress included $18.45 billion for NASA in hard-fought spending compromise lawmakers passed April 14 to fund the federal government for the last five months of the 2011 budget year. Formal passage of the budget compromise Congress and the White House reached April 8 to avert a government shutdown brings an end to the uncertainty that has frustrated decision making at NASA and other federal agencies since the new fiscal year began last October. But it also leaves NASA with a budget some $240 million below last year's level. 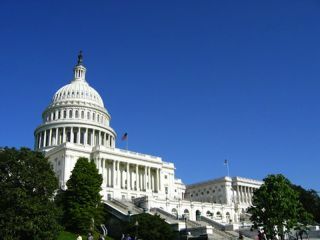 President Barack Obama is expected to sign the spending legislation, H.R. 1473, despite his party's objections to many of the $38 billion in cuts it contains. Most of the NASA savings were achieved by funding Space Operations — an account that includes the international space station and soon-to-be-retired space shuttle — at about $600 million below the 2010 level and denying increases the White House sought for Aeronautics and Education. There's also no funding specified for Space Technology, a roughly $300 million account NASA hopes to boost to $1 billion next year. NASA's Exploration Systems and Science Mission Directorates were the big winners, with both divisions singled out for significant boosts. H.R. 1473 carves out $3.8 billion for Exploration, including $1.2 billion for a multipurpose crew vehicle based on NASA's in-development Orion capsule and $1.8 billion for a heavy-lift vehicle "which shall have a lift capability not less than 130 tons and which shall have an upper stage and other core elements developed simultaneously." Exploration was funded in 2010 at $3.625 billion, a sum that would rise to $3.7 billion under the agency's spending plan for 2012. The NASA Science Mission Directorate — that part of the agency that funds planetary probes, space telescopes and environmental satellites — will receive $4.945 billion for the remainder of 2011, or about $448 million above the 2010 level. H.R. 1473 also frees NASA to formally cancel the Constellation program under which it has been developing the Ares family of rockets and an Orion spacecraft optimized for manned lunar missions. Another policy provision prohibits NASA and the White House Office of Science and Technology Policy from engaging in bilateral activities with China. Space Operations is funded at $5.5 billion, or about $600 million less than 2010. Aeronautics research is funded at $535 million, or about $38 million more than 2010. Cross Agency Support is funded at $3.1 billion, or about $100 million more than 2010. Construction and Environmental Compliance is funded at $394 million, or about $58 million less than 2010. Education is funded at $145 million, or about $45 million less than 2010. No budget is specified for NASA's Office of Inspector General. The watchdog office has received $36 million in recent years.